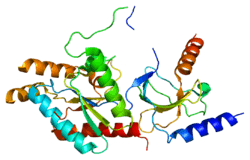 Voltage-dependent L-type calcium channel subunit beta-1 is a protein that in humans is encoded by the CACNB1 gene. ↑ Gregg RG, Powers PA, Hogan K (Mar 1993). "Assignment of the human gene for the beta subunit of the voltage-dependent calcium channel (CACNLB1) to chromosome 17 using somatic cell hybrids and linkage mapping". Genomics. 15 (1): 185–7. doi:10.1006/geno.1993.1029. PMID 8381767. ↑ Iles DE, Segers B, Sengers RC, Monsieurs K, Heytens L, Halsall PJ, Hopkins PM, Ellis FR, Hall-Curran JL, Stewart AD, et al. (Oct 1993). "Genetic mapping of the beta 1- and gamma-subunits of the human skeletal muscle L-type voltage-dependent calcium channel on chromosome 17q and exclusion as candidate genes for malignant hyperthermia susceptibility". Hum Mol Genet. 2 (7): 863–8. doi:10.1093/hmg/2.7.863. PMID 8395940. 1 2 "Entrez Gene: CACNB1 calcium channel, voltage-dependent, beta 1 subunit". Williams ME, Feldman DH, McCue AF, et al. (1992). "Structure and functional expression of alpha 1, alpha 2, and beta subunits of a novel human neuronal calcium channel subtype.". Neuron. 8 (1): 71–84. doi:10.1016/0896-6273(92)90109-Q. PMID 1309651. Perez-Reyes E, Castellano A, Kim HS, et al. (1992). "Cloning and expression of a cardiac/brain beta subunit of the L-type calcium channel.". J. Biol. Chem. 267 (3): 1792–7. PMID 1370480. Powers PA, Liu S, Hogan K, Gregg RG (1992). "Skeletal muscle and brain isoforms of a beta-subunit of human voltage-dependent calcium channels are encoded by a single gene.". J. Biol. Chem. 267 (32): 22967–72. PMID 1385409. Pragnell M, Sakamoto J, Jay SD, Campbell KP (1991). "Cloning and tissue-specific expression of the brain calcium channel beta-subunit.". FEBS Lett. 291 (2): 253–8. doi:10.1016/0014-5793(91)81296-K. PMID 1657644. Collin T, Wang JJ, Nargeot J, Schwartz A (1993). "Molecular cloning of three isoforms of the L-type voltage-dependent calcium channel beta subunit from normal human heart.". Circ. Res. 72 (6): 1337–44. doi:10.1161/01.res.72.6.1337. PMID 7916667. Fukuda K, Kaneko S, Yada N, et al. (1997). "Cyclic AMP-dependent modulation of N- and Q-type Ca2+ channels expressed in Xenopus oocytes.". Neurosci. Lett. 217 (1): 13–6. doi:10.1016/0304-3940(96)13055-X. PMID 8905728. Gregg RG, Messing A, Strube C, et al. (1997). "Absence of the β subunit (cchb1) of the skeletal muscle dihydropyridine receptor alters expression of the α1 subunit and eliminates excitation-contraction coupling". Proc. Natl. Acad. Sci. U.S.A. 93 (24): 13961–6. doi:10.1073/pnas.93.24.13961. PMC 19477 . PMID 8943043. Brice NL, Dolphin AC (1999). "Differential plasma membrane targeting of voltage-dependent calcium channel subunits expressed in a polarized epithelial cell line". J. Physiol. (Lond.). 515 ( Pt 3) (3): 685–94. doi:10.1111/j.1469-7793.1999.685ab.x. PMC 2269176 . PMID 10066897. Lie AA, Blümcke I, Volsen SG, et al. (1999). "Distribution of voltage-dependent calcium channel beta subunits in the hippocampus of patients with temporal lobe epilepsy". Neuroscience. 93 (2): 449–56. doi:10.1016/S0306-4522(99)00162-1. PMID 10465427. Hogan K, Greg RG, Powers PA (2000). "Structure and alternative splicing of the gene encoding the human beta1 subunit of voltage dependent calcium channels". Neurosci. Lett. 277 (2): 111–4. doi:10.1016/S0304-3940(99)00851-4. PMID 10624822. Finlin BS, Crump SM, Satin J, Andres DA (2004). "Regulation of voltage-gated calcium channel activity by the Rem and Rad GTPases". Proc. Natl. Acad. Sci. U.S.A. 100 (24): 14469–74. doi:10.1073/pnas.2437756100. PMC 283615 . PMID 14623965. Foell JD, Balijepalli RC, Delisle BP, et al. (2004). "Molecular heterogeneity of calcium channel beta-subunits in canine and human heart: evidence for differential subcellular localization". Physiol. Genomics. 17 (2): 183–200. doi:10.1152/physiolgenomics.00207.2003. PMID 14762176. Lim J, Hao T, Shaw C, et al. (2006). "A protein-protein interaction network for human inherited ataxias and disorders of Purkinje cell degeneration". Cell. 125 (4): 801–14. doi:10.1016/j.cell.2006.03.032. PMID 16713569.